The myths surrounding Flux Cored wire often obscure the substantial benefits it offers. At first glance, gas-shielded flux cored welding might seem like the most troublesome filler metal to use. On the one hand, you have to deal with the headaches of chipping slag. On the other, you have to contend with the portability and location limitations of using an external shielding gas. Still, there are very good reasons for using gas-shielded flux cored wire. Unfortunately, the myths surrounding this type of wire often obscure the benefits and prevent companies from considering it as a viable option for their welding operations. Below, we identify and “bust” four common myths about this often misunderstood filler metal. Armed with this information we hope you will be able to make informed choices when selecting welding wires and take notice the of the benefits when using flux cored wire on your next job. Myth #1: Gas-shielded flux-cored wire is more expensive than solid wire. Truth: If filler metal were the only expense in a welding operation, this statement would be true. As it stands, however, filler metal is only a minor cost in the overall welding operation. Although gas-shielded flux cored wire costs more than solid wire, the productivity gains possible with it can significantly outweigh the marginal increase in cost. The slag system of flux cored wires allows them to be welded at higher amperages than solid wire without the weld puddle becoming too fluid. This increases deposition rates and allows welding operators to use larger diameter wires than would be possible with solid wire. For example, a 1.2 gas-shielded flux-cored wire in the AWS class E71T-1C H8 can deposit 4kg/h of wire in the flat position. A comparable 1.2 diameter ER70S-6 solid wire can deposit up to 2.8kg/h of wire at the same amperage. If a welding operator averages four hours of arc time per day, that equals 4.8kg more wire deposited per day or a productivity improvement of over 41 percent with the flux cored wire. Given that labour accounts for roughly 80 percent of a welding operation’s costs, the potential for increased profitability becomes very substantial. Further, a 1.4 mm gas-shielded flux-cored E71T-1C H8 wire can often be used in applications where 1.2 solid wire is being used. A 1.4 mm wire can deposit 4.9kg of wire per hour, for a 71 percent increase in productivity or 8.1kg of wire more per day than with a 1.2 solid wire. The benefits of gas-shielded flux-cored wire over solid wire are further amplified in vertical up applications. At current loads and wire diameters that cause a typical solid wire to become too fluid and run out of the joint, the slag system and arc cone of a gas-shielded flux-cored wire under the same conditions allows it to remain in the joint and achieve better tie-in to the side walls. This in turn reduces weld failures and rework, and lowers overall production costs. Myth #2: Gas-shielded flux-cored wires are not suitable for outdoor applications. Truth: Yes, a wind screen is necessary if there is a breeze over 8 km/hr, but that shouldn’t negate the fact that gas-shielded flux-cored wires can provide substantial improvements over both self-shielded flux cored wire and stick welding in certain outdoor applications. For pipelines, structural steel erection, heavy equipment repair, and a number of other outdoor applications, the increased deposition rates of gas-shielded flux-cored wire can result in higher net productivity than self-shielded wire, offsetting the extra time it takes to set up the wind screen. For example, an 1.6 mm E71T-8J H8 self-shielded flux-cored wire can deposit 3.8kg of wire in a flat position at 300 amps. A comparable 1.6 mm E71T-1C H8 gas-shielded flux-cored wire, by contrast, can deposit 4.7kg of wire per hour using the same current for a nearly 25 percent increase in operator efficiency. Although stick electrodes can achieve deposition rates comparable to gas-shielded flux-cored wire, those benefits are negated by the need to stop and change electrodes on a frequent basis. Myth #3: All gas-shielded flux-cored wires within the same AWS categories weld the same. Truth: American Welding Society classifications dictate a number of factors, including tensile strength, weld position capabilities, shielding gas requirements and hydrogen content. What they don’t determine, however, can be just as important to a specific application as what they do indicate. As a result of the different fluxing agents used in the wire, different gas-shielded flux-cored wires within the same AWS categories can differ significantly in terms of spatter, fume levels, arc force, weldability, bead contours, slag, toughness and more. Gas-shielded flux-cored wires within AWS category E71T-1C/M H8 all have tensile strength values of at least 70 ksi, all-position capabilities, CO2 or mixed Ar/CO2 gas requirements, impact toughness of at least 27 Joules at –40°C and hydrogen content below 8 ml/100g. While these specifications help determine the type of wire you use for your application, they do not tell the whole story. For example, two gas-shielded flux-cored wires from the same manufacturer can both fall within the exact same E71T-1C/M H8 category, yet offer significant differences that can have both practical and economic impacts on your welding operation. Although the two wires are in the same AWS class, they could have significant differences in arc qualities, penetration profiles, spatter levels, slag systems, out of position capabilities and more. Choosing a wire based on its AWS classification without also referring to these additional traits can result in reduced productivity and excessive downtime spent grinding and reworking bad welds and removing slag and spatter. Myth #4: Gas-shielded flux-cored wire doesn’t benefit from pulse welding. 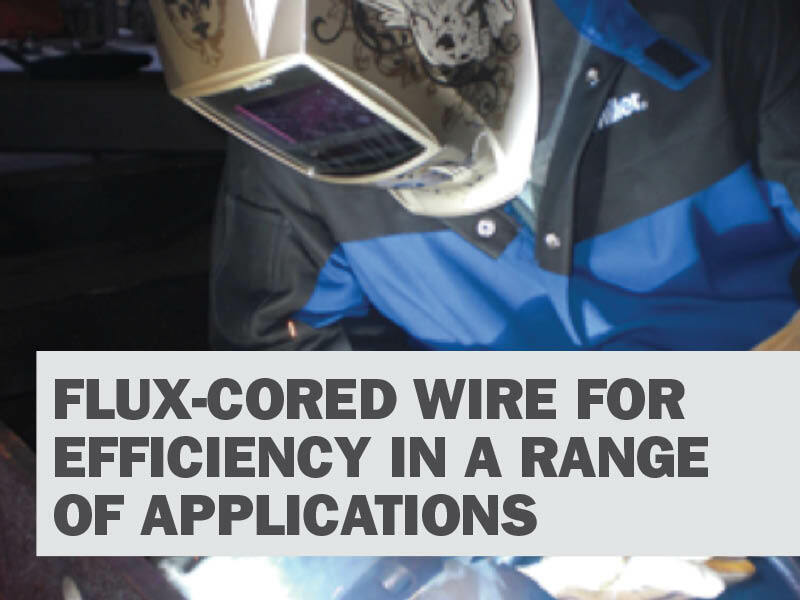 Truth: Most flux-cored wires do not exhibit improved welding performance with pulsed welding. However, small diameter (1.2 mm) T-5 of wires (ex: E70T-5C), are not only able to be used with a pulsed welding program, they show definite improvement in bead contour and spatter reduction. Pulsed welding reduces the overall heat input to the work piece by ramping up the electrical current until it is sufficient to create filler metal transfer. Then the current reverts to a background level that is able to maintain the arc but not strong enough to create metal transfer. The weld puddle is then able to cool slightly before the current increases and deposits more filler metal again. Using a traditional short circuit process, the lime-based slag in T-5 wires produces excessive amounts of spatter and makes them very difficult to use in vertical applications. Using a pulse program improves the weldability of the T-5 class of wires substantially, resulting in faster travel speeds, increased deposition rates, less spatter, increased all-position puddle control and the ability to work thinner sections of material without risking distortion. In general, T-5 gas-shielded flux-cored wires are used in heavy equipment manufacturing, such as farm and construction equipment, and are preferred for their ability to provide very high deposition rates, high impact toughness and low hydrogen content. The basic slag system used in T-5 wires produces a very high quality weld deposit that his very resistant to cracking, making this class of wire ideal for welding metals that are exposed to severe weather and mechanical stress. These categories of wire are available in both carbon steel and low alloy varieties. It is important if pulsed welding with these wires, however, to use a smaller diameter wire — generally 1.6 mm or less. Also, because of the fast cooling weld puddle, pulsed welding generally results in shallower penetration than non-pulsed welding, so care should be taken to ensure the weld meets the penetration requirements of the application. The weld qualities and productivity improvements offered by gas shielded flux-cored wires are often overlooked as a result of commonly held myths about their suitability for a variety of applications. A clearer understanding of the range and capabilities of this class of wires, however, reveals that they can offer the best combination of efficiency and welder appeal for many industrial welding environments. Take a look through WIA's range of Flux Cored Wires and view our feature page on Hobart Flux Cored Wires. We also have a range of safety data sheets so you can compare welding wire properties.